Peanutty Seviya with a Tadka Punch! Peanutty Seviya with tadka punch! It was my turn to host the book club this month. The book we read was Jody Picoult’s ‘Leaving Time’. My children chuckle as they ask me if I have a theme in mind. They know mom is enthusiastic (goes nuts) with themes:) I loved reading about elephant behavior and the elephant sanctuary, in the book. So I added a touch of the elephant theme to the table. I also made the fiesta samosas and the ambrosial mango pie.Here are some quick pictures that I took-. My little signs in the making! Add salt and a teaspoon of oil to the boiling water. Add the seviya or angel hair pasta and cook it al dente. Drain the pasta, reserving 1 ½ cups of the pasta water. Set aside. 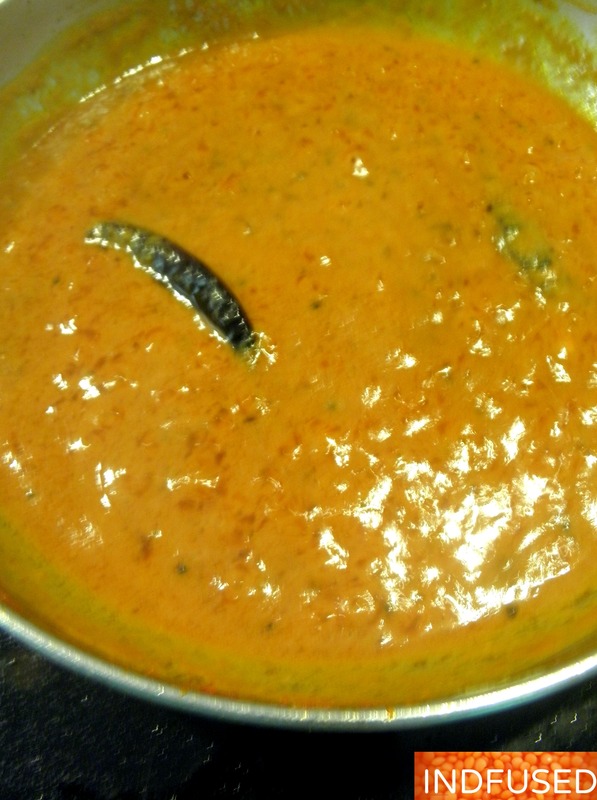 In a separate pan, heat the tablespoon of oil over medium heat and add the urad dal, cumin seeds, mustard seeds, red chilies and asafetida. When the mustard seeds start spluttering, add the grated garlic and stir for about 30 seconds. Reduce heat to low. Add the tomato paste and stir until the paste is fragrant, about 1 minute. Add the peanut butter, stir and add the water, sea salt and brown sugar. Let it simmer for a minute. Stir in the seviya or angel hair pasta and the lime juice. Toss well. Remove from heat and serve with the spiral cut veggies. You can add veggies to the sauce. 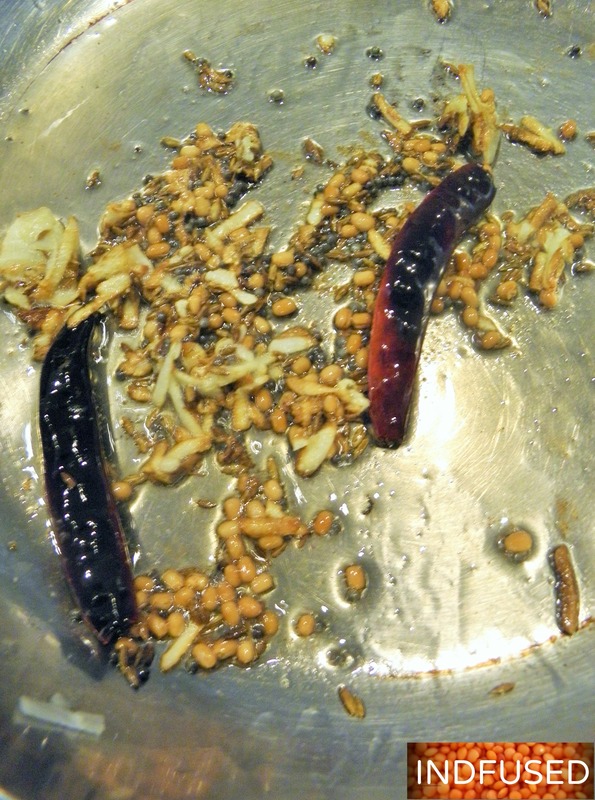 Fresh curry leaves can be added to the tempering spices too. 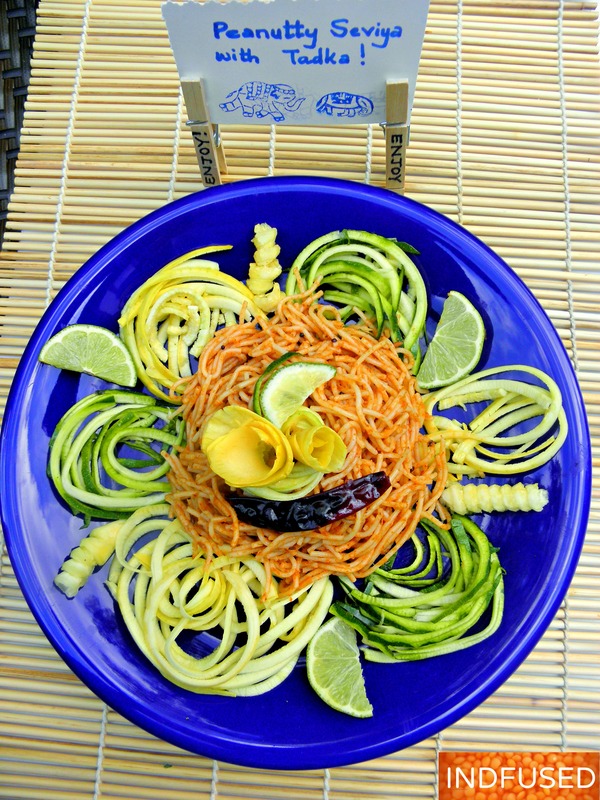 This can be made with just the vegetable spirals too. The noodles also taste great cold. So it is a great summer potluck dish! Oh My! The Ambrosial Mango Pie ! What a clever post Sandhya, I can tell you enjoyed putting it all together didn’t you? I’ve read a few Jody Picoult’s books, but I can’t say I’ve read that one. I’m reading The Goldfinch right now, about 600 pages long, it will prob take me all summer :). It’s quite new and a fab read. I am not familiar with the dish you’ve created, but it does look wonderful. I like your little signs on your clothes pegs too 🙂 Some ideas for me for that next theme inspired dinner, which we enjoy having too. We had a curry night in February where everyone had to bring a curry from a different country, it was amazing, we could have used those signs then :). Do you have the machine for making those zucchini pasta? I recently bought one, but it is not fancy, it is just like a potato peeler, but I like the idea of using veggies in long narrow noodles. Thanks Loretta. I go crazy with themes. Had done that for the kids birthdays when they were little. I think your idea for curry night was brilliant! So much fun getting together with these themes. I recycle the clothes pins with new signs. So it works out great- simple yet effective. The women in my book club wanted to eat Indian food. So the signs help. I bought the little ‘vegetti’ handheld thing for the zucchini pasta too. the big one looks so too big for storage and this worked fine. I like the idea of the vegetable pasta ribbons also. Thank you! I love terracotta things a lot too. Thank you so much Antonia! You are so sweet! I like how you show a lovely plate. Good presentation of all the elements of a nice dining experience. Here it is another weekend flying by. Hope you enjoy yours, Sandhya. Thanks Robin. I hope you have a great weekend too!